Hi there! Today I’m sharing my review for a newly released contemporary romance from bestselling author Sonali Dev. THE BOLLYWOOD BRIDE is a reconnection romance between two people whose lives went astray after their families got involved. It features Ria, a Bollywood star, and her forsaken love, Vik, meeting at the wedding of their mutual cousin Nik after a ten year separation. It is tender and torrid, and deals with mental illness and the Indian community. I really enjoyed many aspects of this second-chance romance. Ria is a Bollywood star, with a reputation as an Ice Princess. She has no trysts, and only a few skeletons–a casting couch issue and her clinically insane mother who beat her near to death as a child and killed her father after setting their home on fire. The press hounds her and catches her in a compromising position on her balcony–but her manager has it handled…for now. In the meantime Ria’s cousin Nikhal is getting married and she’s being summoned back the the only real home she ever knew: her aunt and uncle’s house in suburban Chicago. Problem? Nik’s other cousin, Vikram, will surely be there. And Ria and Vik had a bold love affair ten years ago that ended REALLY REALLY badly. Ria hurt Vik super, duper bad (it was for his own good!!!) and he’s not likely to let that go. First, and foremost, I loved the Indian cultural aspects–from tumultuous Mumbai to the Chicagoland settings. The relationships were delightfully depicted. All the auntie’s and uncle’s weighing in on the proceedings. All the families of their community being so close-knit is an accurate representation of first-gen immigrants here in Chicagotown. I’ve had many experiences with the Indian community (even dated a young Indian man as a girl) and they are a lively and loving group. Be prepared to lose track of the accessory characters…there are many and they all have actual names and nicknames. Second, I loved how loving this part of Ria’s family is. Everyone embraces everyone else with open arms. Nik’s fiance is Chinese, but she is so captivated by Nik’s family that she plans a proper Hindu wedding. Ria’s expertise (having been a bride in about 20 Bollywood films) is indispensable and welcomed. It’s not all sunshine and samosas, however. Vik’s absolutely furious with Ria, still, after ten years. He lost his youthful heart to her, and it set his whole life off course, in his parents’ opinions. Anywho, Ria’s a big celebrity in the Chicago Indian community, and she’s aloof but gracious, as always. Inside, she’s a wreck. She’s still gone over Vik, who’s a Class A Jackass to her and his current girlfriend. I get that he’s had it rough, but I half expected him to demand sati over the pyre of his broken heart. He’s ice-cold, then luke warm, then cold, then burning hot, and it’s a lot to take in. Especially for Ria who’s not sure she’s altogether there, mentally. Remember, her mom’s crazytown, and everyone said she was normal until she gave birth. And the same was said about her maternal grandmother. Ria “comes from insanity” so she can never be a true partner to anyone, least of all her beloved Vik. I think the ending was spectacular. And I was so glad that there was some happiness for Ria, and for Vik (though this was less of a priority for me). By the end I didn’t dislike Vik anymore, and I really, really liked Ria. I know she’s supposed to be hesitant, and second-guessing due to her fears of insanity, but it got to be a little much. She clearly drove herself to obsessive-compulsive behaviors in her contemplation of her mental health. Which, was NOT GOOD. That said, I loved the culture, I loved the family, and I liked the romance, which heated up quite nicely. I wanted more likable main characters, but I got human ones with reasonable frailties instead, and that’s pretty okay, too. Interested? 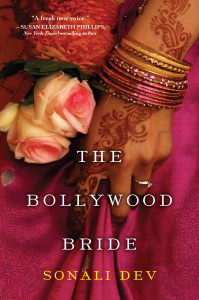 You can find THE BOLLYWOOD BRIDE on Goodreads, Amazon, and Barnes & Noble. Also in libraries and discount booksellers like Target, Walmart, etc. I received a review copy of this book via NetGalley. You can find Sonali online on her website, Facebook and twitter.